Origin- How did it all begin? In the 1920’s, a new type of woman was born. She wore make-up and cut her hair short, danced, smoked and voted. She was a risk taker and went to parties. She was a flapper. Before the start of World War I, women wore their long hair loosely on top of their heads and wore long straight skirts with shirts with high collars. She was very feminine but also participated in sports such as golf, roller skating and bicycling. Then, World War I began and many men were sent off to fight and leave their country. They left behind girlfriends and daughters and were forced to face the devastating reality of death. Many were left traumatised and lost hope in surviving long enough to return home. When the war was over, the survivors went home and tried to go back to normal. Unfortunately, it was more difficult than expected. During the war, while the men had fought in far away lands, the women had bought into the patriotic commitment and entered the workforce. The war had caused both men and women to break out of society’s structure. This generation had broken away from the traditional set of values. The TermThe term “flapper” was first used in Great Britain after World War I. 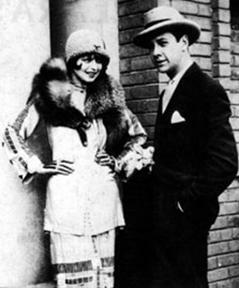 Authors such F. Scott Fitzgerald and artists such as John Held Jr. first used the term to reflect and create the image and style of the flapper. Held drew flappers as young girls wearing unbuckled galoshes that would make a "flapping" noise when they walked. Fitzgerald described the ideal flapper as "lovely, expensive, and about nineteen." The Flapper’s image was considered shocking as the style completely contrasted the traditional ‘Gibson Girl’. Nearly every article of clothing was trimmed down and lighter to allow them to move more easily as they danced. They also replaced their pantaloons and corsets with underwear called ‘step-ins’.